(March 3, 2014- Boston, MA): Mike Lake, Democratic Candidate for Lt. 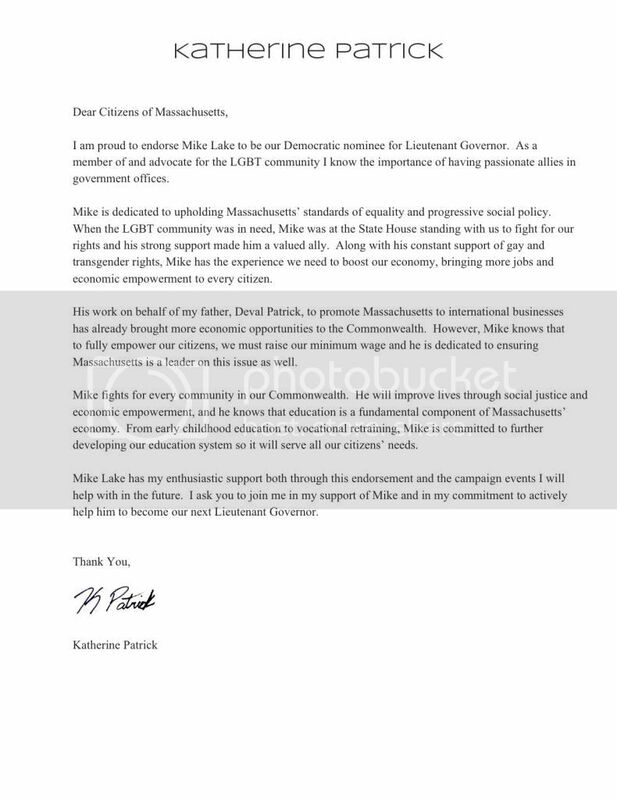 Governor, was officially endorsed by Katherine Patrick, LGBT advocate and daughter of Governor Deval Patrick. She praised his dedication to progressive social politics. Patrick, who worked as the Director of Community Relations for Governor Patrick’s reelection campaign, commends Lake’s work with the current administration. Lake was appointed by President Clinton as Special Assistant for White House Operations and is the President and CEO of Leading Cities, an international organization that focuses on exchanging solutions to municipal challenges and creating jobs through business development. Lake was also endorsed by former Governor and Democratic presidential nominee Michael Dukakis and his wife Kitty. Mike Lake was officially endorsed by State Representative Russell Holmes of the Sixth Suffolk District this week. Holmes emphasized his shared commitment to strengthening business communities. Mike Lake, Democratic Candidate for Lt. Governor, was officially endorsed by Governor’s Council member Eileen Duff. She believes he has the experience, work ethic, and perseverance necessary for the position.